Over the years, I've experimented quite a bit with grilling or smoking whole chickens. 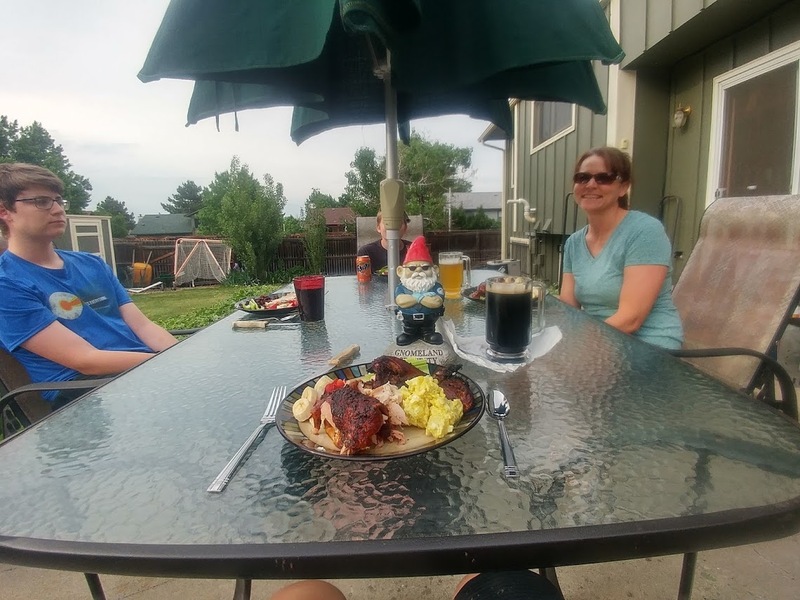 I've tried Beer Can Chicken. I've done simple indirect heat Grilled Chicken. I've grilled chicken standing up like Beer Can, but without the beer. 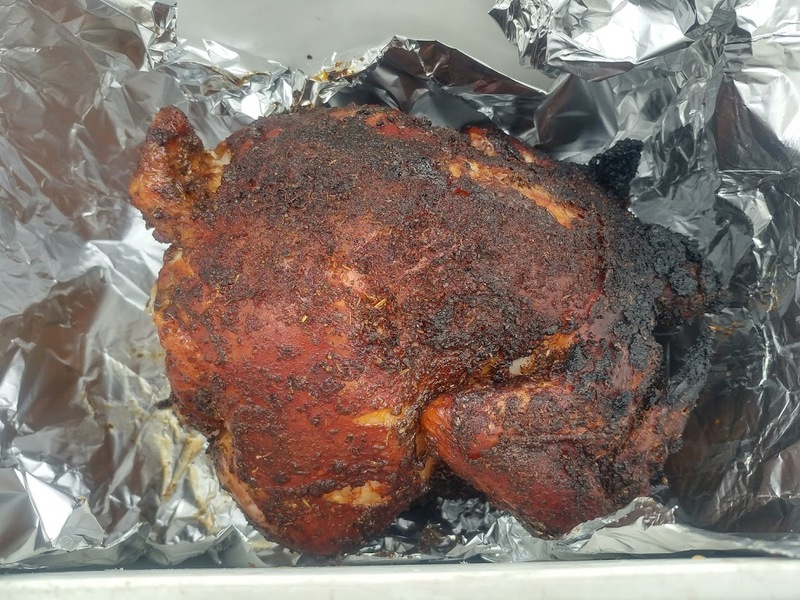 I've smoked Apple Wood Smoked Chicken. 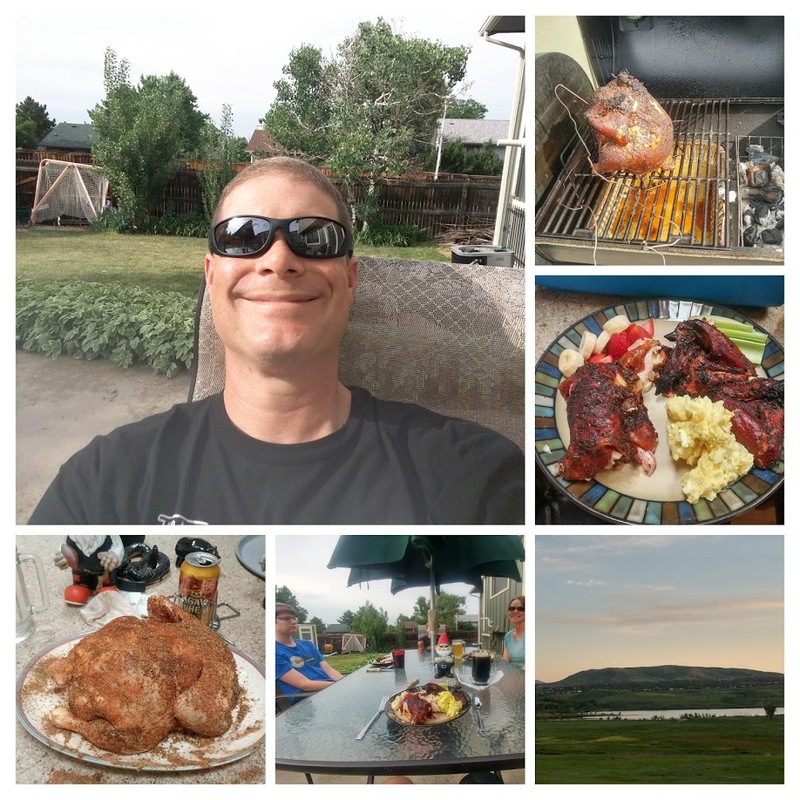 I like grilling / smoking chicken. As you can probably tell, I always do it a little different. 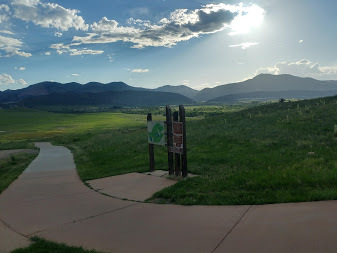 It always turns out awesome. I'm not convinced one technique is significant'y better than any other. As long as you cook for the right amount of time at a decent temperature, it turns out great. Last Sunday, I added a new twist on my latest Smoked Chicken. 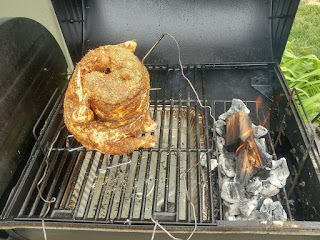 This was an Apple Wood Smoked Beer Can Chicken. I also put the coals and wood in the charcoal grill portion of the grill rather than the fire box. 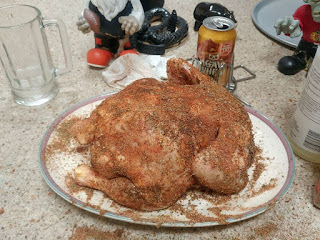 Sunday, I started off by applying a dry rub to the chicken. I let that sit on the chicken until mid-afternoon. Around 3pm, I made and applied a rub to the chicken. I am sure there was other spices in there. But, again, I wouldn't be able to name what else was in there. I started up about 3/4 of a chimney of lump and briquette charcoal, and placed it in a little cage on the right side of my grill. I added a couple chunks of apple wood. Around 3:30, the chicken went on the other side on top of a water pan. I let the chicken cook. My temperature was very consistent with this setup. I averaged around 340. I don't think I got below 330 or above 350. Much more consistent than I've ever gotten with the fire box. It is also hotter than I would call "low and slow". I basically just let it cook. The only time I opened the lid was to add more apple wood and to rotate the chicken. The internal temperature of the chicken went up steadily. Around 5:30, the alarm went off indicating that the breast was at 165. My instant read thermometer indicated a little higher most places. Most of the readings were pretty close to 175. So, I took the chicken off the grill, and placed it in a cooler for around 25 minutes. As you can tell, from the picture above, there were a couple of charred spots, but most of the bird was a wonderful roasted color. And ... OMG ... it tasted wonderful. Whatever I put in that rub was perfect. That 340 temperature with the heat right next to the meat turned out great. 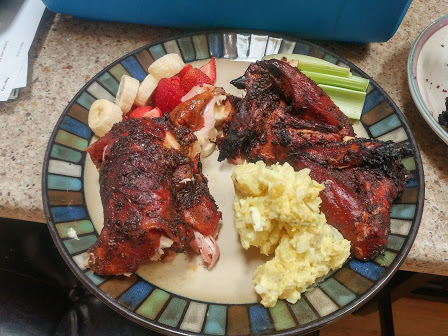 Honestly, I am fairly certain this is the best grilled or smoked chicken I've ever made, and I am thinking that it is the best chicken I've ever tasted. I think this is my new recipe / procedure for whole chickens. I'm not convinced the beer adds anything, so I may try the next one standing up like beer can chicken, but without the beer. We'll see. Regardless, I was very happy with this chicken. The family loved it too. And ... Eventually you'll a video for this on SheppyBrew Smokehouse and Brewery youtube channel.